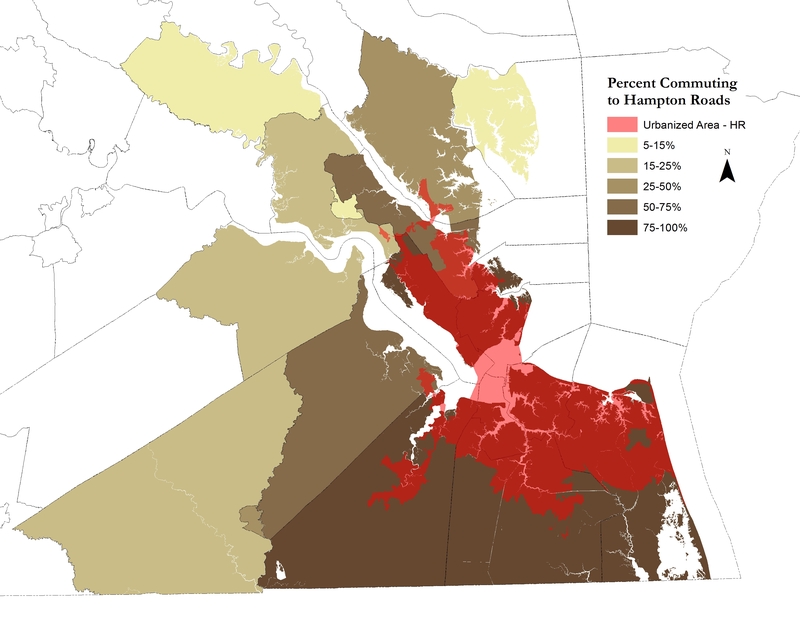 As Hamilton noted when posting the map of updated Virginia Metropolitan Statistical Areas, the MSA’s are calculated with commuting statistics. If more than 25% of workers in a locality commute to a nearby metropolitan area, that county is considered to be closely linked to it. This is a useful cutoff point, but like all cutoffs, it is completely arbitrary. I mapped five of the state’s largest MSA’s to show the degree to which their surrounding counties are dependent on them. 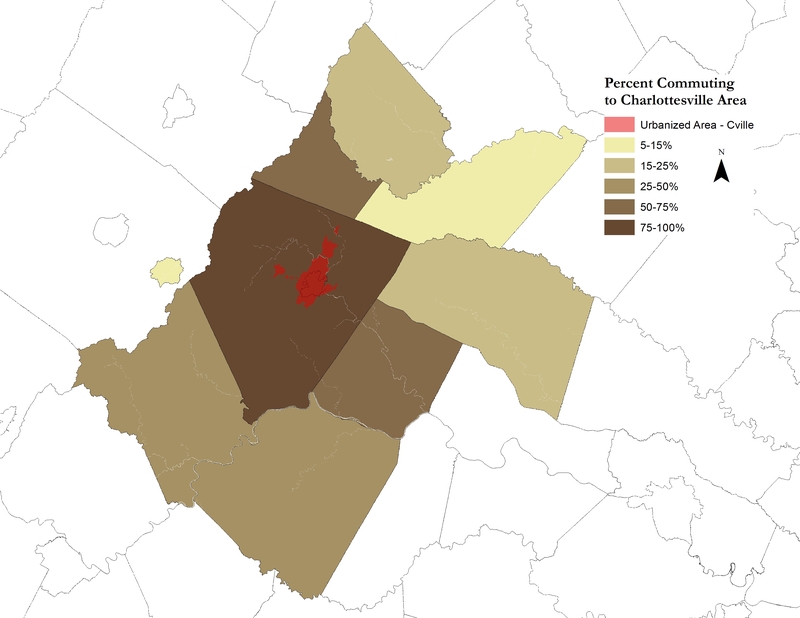 This is important to understand since a significant part of Virginia’s “rural” areas are becoming increasingly exurban – dependent on nearby urban economies rather than agriculture or local industries. 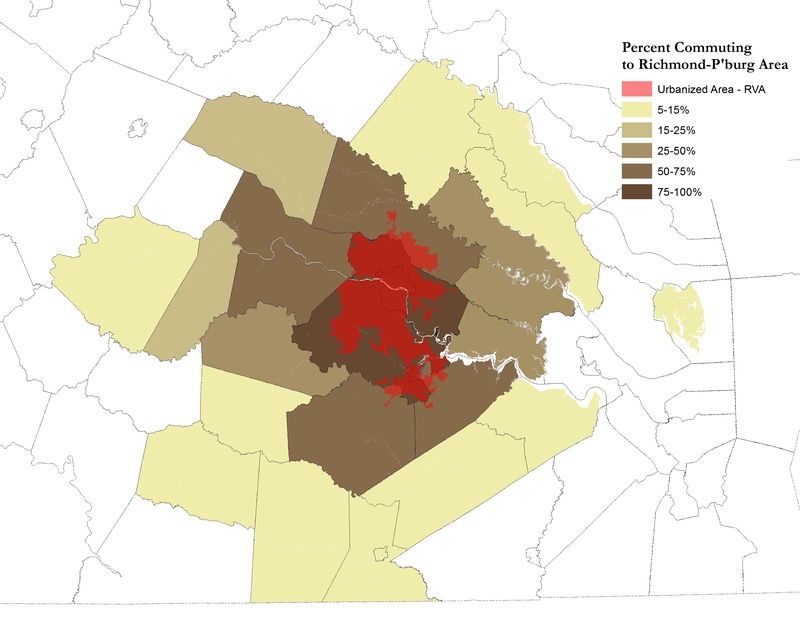 Again, 25% is the cutoff for inclusion in the MSA (see Hamilton’s map linked above). That includes all workers commuting to one of the core counties of the MSA. The “core counties” are not explicitly listed anywhere that we’ve been able to find, but there is a definition and by working backwards from the commuting numbers it’s not too hard to figure out. Lastly, here’s a map showing the percentage of workers who commute to a different county or city. Higher percentages indicate that a locality is an exurban or bedroom community for another area (or just part of another urban area with long commutes). Lower percentages mean the locality employs most of its residents, suggesting a more self-contained economy or that it is a dominant center of employment in a metro area. A few things struck me while looking at these maps. The first is the complete independence of the Eastern Shore from any major metropolitan area, helping to explain why its median incomes are so low. The second is the sheer reach of the Richmond area. It makes sense for NoVA, where housing prices further in can be drastically higher. 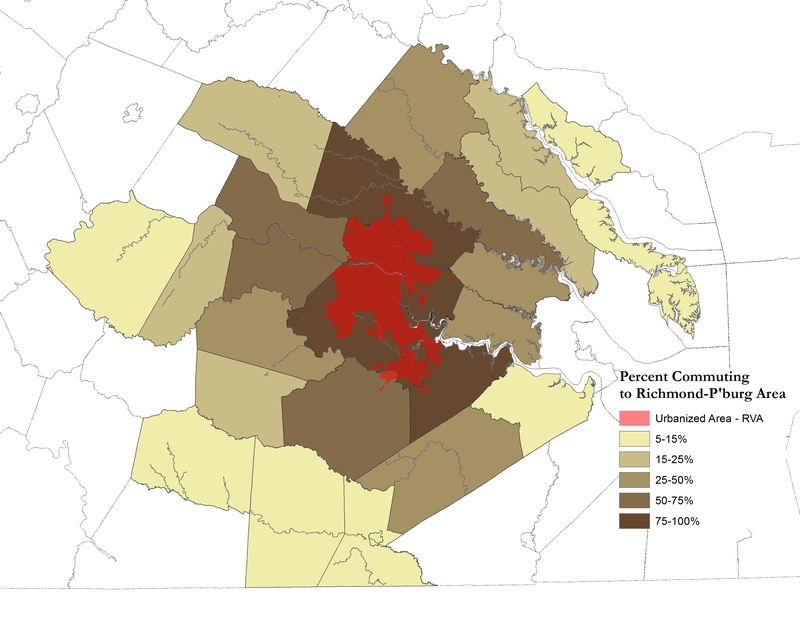 Richmond’s housing prices, and those of its immediately surrounding counties, are much lower. Lastly, the Northern Neck and Middle Peninsula, which are generally considered to be poorer regions, are fast becoming exurban areas for the urban crescent, which makes sense. I wouldn’t be surprised to see them explode with vacation homes and retirees in the next few decades.